. (1395). چکیده های انگلیسی. میقات حج, 24(95), 159-168.
. "چکیده های انگلیسی". میقات حج, 24, 95, 1395, 159-168.
. (1395). 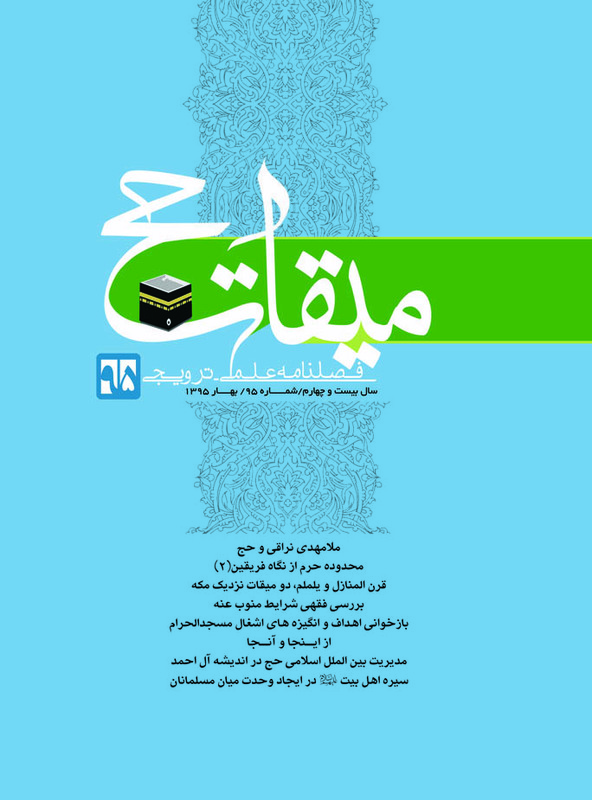 'چکیده های انگلیسی', میقات حج, 24(95), pp. 159-168.
. چکیده های انگلیسی. میقات حج, 1395; 24(95): 159-168. Pilgrimage among the religious beliefs has a special philosophy, place and provisions. An act which scholars and experts have spoken about very different aspects of its issues. . In this study different aspects of pilgrimage, such rituals, rules, philosophy and requirements, Hajj and ethics, Hajj and mysticism (Irfan), pilgrimage and educational perspective from the popular scholar view Mulla Mahdi Naraqi will be discussed. Naraqi holds Hajj as the most impressive pillars of Islam and the most important factor for the servant proximity to the Lord and making purification of the soul. From the mystical perspective pilgrimage increases the sincerity of the soul, removes the arrogance polishes up the human spirit. Naraqi knows the first phase of this movement coming out of his own material ego and possessions and believes that the person wearing ihram is going to be released of a variety of material possessions, privileges, self-glorification, and adornment to find an angelic state. Hajj is a great educational work; one of these works, understanding and familiarity with the works and traditions of the Prophet (s.a.w) and keeping them alive and preserving not be forgotten. Hajj is in fact an overview of the history of Islam and the Prophet's (s.a.w) Hajj and also an overview of the monotheism history and the history of the prophets from Adam (a.s) to Muhammad (s.a.w) and a panel for all the sacrifices of the champion of monotheism and the last prophet which gives the pilgrim many lessons and messages when he see the locations and scenes. Naraqi regards Hajj as an entrance to the hereafter. Keywords: pilgrimage, Mulla Mahdi Naraqi, rituals, laws of Hajj, the pilgrimage philosophy, ethics, mysticism, training. In the first part (over in 94th No. ), regarding "the area of the shrine from Shiite traditions and jurists", and '' Sunni scholars explain about the shrine area" were discussed in detail. The second part of this article is on the "symptoms and signs"; the signs of four limits including east, north, west and south. The eastern limit with one hundred and ten signs, the northern limit has five hundred and ninety-four, which has the most signs and symptoms, Ninety-eight for the west and one hundred and sixty eight for the south. 1. At the time of Prophet Adam (a.s) and creation of the heaven and earth. 2. It is related to the time of Prophet Abraham (a.s). And finally determination of the shrine was from Divine command and this claim is not in dispute. The client (Manoub 'anh), such as the vice (Na'ib), mush have special requirements and conditions in Hajj and Umrah. Some of the discussed requirements among Shi'a jurists include: conditioning death of manoub 'anh, being excused (manoub 'anh), maturity of manoub 'anh and lack of madness. Concerning the conditioning death of manoub 'anh in the Hajj, the great jurists are unanimous. Making hajj on behalf of an alive or healthy person that is able to do hajj (Mobasheri hajj) is not permissible unless he fails or is excused from performing Hajj by himself. But in the recommended Hajj and Umrah such conditions are not necessary.About stipulating maturity of manoub 'anh such condition is not requiredbut on behalf of infants, the discerning infants and non-discerning infants should be differed. Making hajj on behalf is correct for the fromer one and not for the latter. Concerning the rationality of Manoub 'anh should be distinguished between permanent and periodic insanity. In the sense that hajj on behalf is not correct for the permanent madness. But on periodic insanity if during the wellness time the hajj became obligatory upon him taking a na'ib is correct and even obligatory. Key words: Manoub 'anh, Hajj, 'Umrah, Conditions, Niyabat, Death, Being Excused, Maturity and Rationality. Afaqi people in addition to the Meeqaats of Shajarah, Juhfa and Aqiq can wear Ihram from the Meeqaats of Qarn al-Manazil and Yalamlam. Since the two oldest and closest Meeqaats to Mecca, is rarely discussed, this article is assigned to it. What is considerable in the subjectology of the two meeqaat is that, "The Sail al-Kebir" is located in Qarn al-Manazil area but assuming Qarn al-Manazil as the "valley of Muharram" is not provable. In the course of Yemen to Mecca, Yalamlam is on the way of Tehama and two other ways end to Qarn al-Manazil. From the predicate, the meeqaat of the two, citing multiple Shiite and Sunni narratives and is consensus and the opposing traditions are not acceptable. Notably, during the Hajj season, the servants of the caravan who entered dignified Makkah for the convoy affairs with the intention of 'Umrah Mufradah, and a few days before the start of hajj want to wear Ihram for pilgrimage, wearing ihram from the two meeqaats because of their proximity to Mecca is recommended. Key Words: Ihram, Meeqaat, Makkah, Qarn al-Manazil, Yalamlam. In the year 1400 AH. On the first day of Muharram in the year 1400 AH, Masjid al-Haram was occupied by a group headed by Al- Juhayman Outaibi. They pledge allegiance to the person whom is called as promised Mahdi. Confrontation with the armed government leads to the massive killing and abundant bloodshed. After a week of fighting, the Saudi government fails and inevitably, seeks help from Western countries. Finally, after two weeks, the fire appears to be put out but the dimensions, deep roots and intensity of its influence in the community pretty soon becomes clear. The incident caused a major change in policy and governance is the dynasty of Saud. On the other hand, the movement also became an inspiration for the Salafist-Jihadi currents and Juhayman as a role model and hero was praised and adhered. The present article seeks to examine the motivation and aims of Juhayman his companions' uprising. Some believe that the movement is left-style revolution. Still some others consider restricting them to swear allegiance to the Mahdi. The third idea introduced it as a coup to assassinate leaders of the Saud dynasty. From Juhayman words and also from works of his like-minded friends light up the realize of fulfilling the apocalyptic traditions in which both pledging allegiance to the Mahdi and construction of corruption and innovations occur. Here are some other points that will be elaborated. a detailed and scholarly look seeks to explore the political, cultural and social relations in the land of revelation land and his perceptions of Sa'udi Arabia situations has been compiled in the travelogues. In this paper, organized by the analytical method, it will be clear that Jalal al- Ahmad, seeing the troubles of hajj administration, holds the ravages as a result of Sa'udi regime mismanagement. In his view any improvements could be achieved through the Islamic international management of hajj. He holds hajj as a precious opportunity for progress and prosperity of the Muslim Ummah and realize of the ideal of an Islamic unified nation, which under the expropriation of the Sa'ud dynasty administration and Islamic - international management of Hajj will be achievable. "Tombstone of Mofarraj bin Husain bin Falitah al-Hasani in the cemetery of Abi Talib", "the rebuild date of Khif mosque in 1015 AH by Sultan Ahmad Osmani", "Stone writings of Khif Mosque rebuild in the year 674 AH. by Ali bin Omar Rasouli", "Repair of Hateem (Hijr Ismail) in the year 1073 AH by Mohammad Khan of Othmani (from Ottoman Empire)", "A literary text describing the Hajji (pilgrim) and Hajj (pilgrimage) rituals from the 12th century BC", " Herald (Chavosh) letter to collect and encourage people to Hajj (pilgrimage)", "Two Declarations to collect passengers to travel by ship to Mecca in 1298 AH", "Three samples of contracts for hajj on behalf in the years 1242 and 1230 and 1322 AH", All from several manuscripts. Keywords: Tombstone, Khif Mosque, Hijr Ismail, Herald letters, contracts of Hajj on behalf. Sacred religion of Islam to guide humankind to the path of growth and perfection developed a complete solution, paid special attention to all the human needs and dimensions, and knew the way to achieving excellence in public life. . One of the Muslim community needs is unity and integrity, which plays a very important and decisive role in the social life of Muslims. . Performing divine religion and its light sentences, which guarantees social order and security, justice and solidarity depends on eliminating conflicts and strife in religion because the ominous phenomenon of dispute and dissension endangers the interests and expediency of the Islamic Ummah and will cause a weakness and defeat. Ahlul Bayt (a.s) were always the founders and proclaimers of Unity and have underlined in their conversation and sirah on this important issue. Some examples, such as: respect for the audience sanctities, tolerance of opponent beliefs, solving the legal difficulties and problems of others can be observed and traced. Our main question in this article is that "what was Ahl al-Bayt sirah and method in creating unity among Muslims?" The proposed assumption of the research is that Imams (a.s) depending on the positions and social conditions were in the wake of creating unity among Muslims and insisting the brotherhood and unity of the Islamic Ummah. When we probe on Imam Ali's (a.s) life, his noble character, to maintain unity and avoid divisions within the Muslim community waived his right and suffered 25 years of retreat and isolation. This behavior is indicative of the importance of unity and solidarity of Muslims.